By means of a wonderful ability to fix an idea in his mind, [Rembrandt] knew how to capture the momentary appearances of emotion whenever they appeared in the face before him. 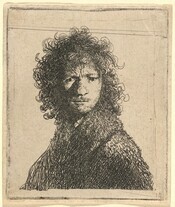 Rembrandt painted, drew, and etched so many self-portraits that changes in his appearance invite us to gauge his moods by comparing one to the other; we read these images biographically because the artist forces us to do so by confronting us directly. 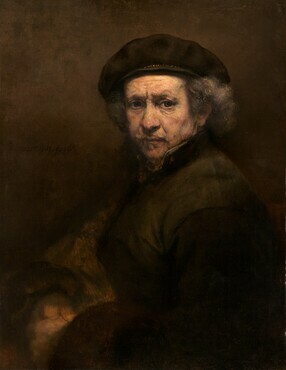 Rembrandt painted this self-portrait in 1659, when he had suffered financial failure after many years of success. His spacious house on the Sint-Anthoniesbreestraat and other possessions had been auctioned the previous year to satisfy his creditors. In this late work, the deep-set eyes that bore into the viewer’s eyes express the wisdom gained from his life experiences. 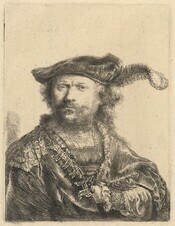 Interpreting a painting on the basis of an artist’s biography may be misleading, however, particularly an artist whose life has been romanticized to the extent of Rembrandt’s. Before the painting was cleaned in 1992, thick layers of discolored varnish had given the portrait a heavy, brooding quality, but when the varnish was removed during restoration, the rich range of pinks and other flesh tones on his face immediately improved our reading of Rembrandt’s expression. The light that so effectively illuminates the head also accents the artist’s left shoulder and, to a lesser extent, his broadly executed clasped hands. Rembrandt’s pose was inspired by Raphael’s famous portrait of Balthasar Castiglione, which he saw at an auction in Amsterdam in 1639. In this late self-portrait, Rembrandt returned to Raphael’s prototype because its dignified pose enabled the artist to present himself as a learned painter. Rembrandt was one of the most versatile artists of the 17th century, exploring a range of genres, including history paintings, portraits, and landscapes. Whatever the subject, his work captures a sense of individual spirit and profound emotional expressiveness, qualities for which he was celebrated in his time. He was born in Leiden, the youngest of at least 10 children. His father, a prosperous miller, was able to send young Rembrandt to the Leiden Latin School, where he received a classical education. Afterwards, was apprenticed to a painter in Leiden, with whom he studied from 1619 to 1621 before advancing to the studio of Pieter Lastman in Amsterdam, the city’s most prominent history painter. 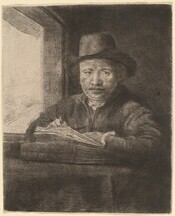 Rembrandt initially copied Lastman’s compositions and subjects, but he soon developed original interpretations of mythological and biblical stories. In these early paintings, Rembrandt began inserting his own portrait as a bystander or participant, initiating a lifelong pursuit of self-portraiture. 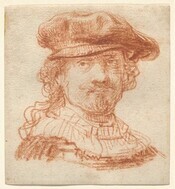 Today nearly 80 self-portraits—paintings, drawings, and prints—are attributed to him. By age 21, the artist had established his own studio and had taken on the first of many students. The quantity of work the studio produced and the number of students who contributed to paintings completed under its auspices has prompted ongoing debates concerning the attribution of many works. Rembrandt achieved an almost unprecedented level of success, with many wealthy and influential clients. In 1633 he married Saskia van Uylenburgh, the niece of his business partner. Saskia, whose image is familiar from many portraits, was from a wealthy family. Rembrandt purchased an expensive house in Amsterdam, but used credit to fund a large part of the purchase, a decision that later affected his financial stability. Saskia died in 1642, leaving Rembrandt to care for their son Titus. Rembrandt later took up with Titus’s nursemaid, a relationship that ended acrimoniously, after which he formed a relationship with his housekeeper Hendrickje Stoffels, also known through Rembrandt’s many depictions of her. Rembrandt never married Hendrickje (a clause in Saskia’s will made remarriage financially disadvantageous), and when she became pregnant with their child, she suffered public condemnation. Their daughter Cornelia was born in 1654. Although Rembrandt continued to receive portrait commissions in the 1650s and 1660s, he could not meet his financial obligations and suffered personal setbacks when both Hendrickje and Titus died of the plague during the 1660s. He was financially dependent on Cornelia during the last years of his life and even sold Saskia’s grave site at the Oude Kerk to pay his debts. Rembrandt died in 1669 and was buried in an unknown grave in the Westerkerk, Amsterdam.